High-throughput screening enables rapid testing of up to millions of compounds to identify small molecule modulators of distinct biochemical activities. Most approaches rely on labels as readouts for enzyme activity. However, the use of a label limits the readout to measure one activity per assay and generates high rates of false positive hits that drive up costs and slow research progress. Label-free approaches, such as traditional mass spectrometry, address many of these limitations, but often lack the throughput necessary for drug discovery applications. 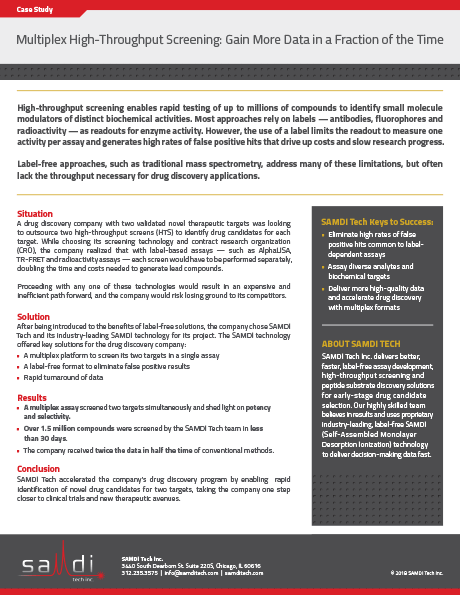 Learn how SAMDI Tech’s industry-leading SAMDI technology accelerated a company’s drug discovery program by enabling rapid identification of novel drug candidates for two targets.